This is The Digital Story Podcast #683, April 16, 2019. Today's theme is "What Makes Nikon, Nikon?" I'm Derrick Story. Nikon is celebrating 60 years of the Nikon F, which was released in 1959 to overcome technical obstacles inherent in the rangefinder design. At that time, the F wasn't designated as a professional camera. But that soon changed. And the events that fueled its evolution are the subject of today's TDS podcast. 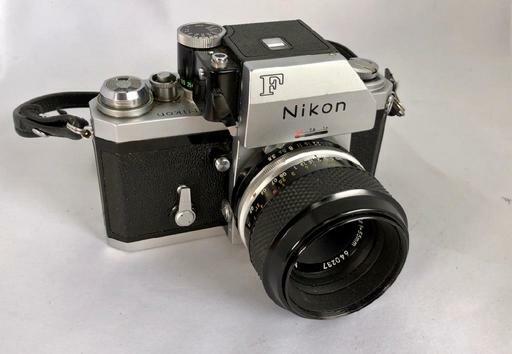 Anyone who has ever pressed the shutter button and wound the film advance on an analog Nikon camera, knows that they were a marvel of mechanical design. And that's one of things that always stood out for me with those early Nikons, was attention to detail. To help illustrate this point, here is a common scenario for me. I will purchase some forgotten Nikon that had been sitting in someone's garage for decades. On the outside, it will be covered in layers of fine grime that had settled on it over the years. It probably endured extreme temperatures as well. More often than not, after a through cleaning of the exterior, and replacing the rubber seals in the back, the camera will fire up, take a picture, and wind with the precision of a finely designed machine. How many of today's cameras would fare as well under those conditions? There are definite milestones to the evolution of the Nikon SLR and DSLR. For today's show, I'm choosing five of them that I think make Nikon, Nikon. 1959 - World's First Telephoto Zoom Lens - In the same year, Nippon Kogaku K.K. released the Auto NIKKOR Telephoto-Zoom 8.5 - 25cm f/4-4.5--the world's very first telephoto zoom lens for still photography cameras. Source: Nikon Rumors. 1971 - NASA and the Nikon F2 - 1971 was a busy year for Nikon. First, the production of Cameras for NASA, which commissioned a specially designed, space-ready cameras for their Apollo 15 and 17 missions. The result was the Nikon Photomic FTN, which was constructed to withstand the extreme environments of space. Also that year, Nikon releases the iconic Nikon F2, which was a reliable, easy-to-use, and feature-packed camera heavily patronized by professional photographers, especially newspaper and magazine photographers of that decade. Source: Nikon Rumors. 1972 - World's First Extra-Low Dispersion Lens - The NIKKOR-H 300mm F2.8, which was the first lens to use extra-low dispersion glass, was released. This technology is widely used today by practically all lens makers. BTW: this camera is truly under-rated. It has a fantastic feature set and great durability, and can be purchased today for less than $100. Other fun facts include that the iconic red line made its debut in 1980 with the Nikon F3. In 1992, Nikon released the NIKONOS RS, the first underwater SLR with autofocus. And in 2004, the company releases the Nikon F6, which was to be the final installment in their highly popular flagship Nikon F-series line. The F6 combines the well-loved features of the previous Nikon F cameras and the latest technological advances during this time. Source: Nikon Rumors. The release of the F6 marks the end of an era, but Nikon does not slow down, with subsequent milestones including the first camera with WiFi, first DSLR with video capture, and back to space with the International Space Station. But after all of this, what still makes Nikon to me is a company that's priority is making cameras, lenses, and the accessories for them. Their optical expertise expands to microscopes, surveying equipment, and scanners. And they don't stray far from products that don't include lenses. Regardless of which camera brand you favor and shoot with, chances are good that Nikon technologies have in some part influenced them. And their 60 year run with the F Mount has been good for all of photography. This is an excerpt from an article published on The Daily Mail. A group of wedding photographers have revealed the relationship 'red flags' they have noticed at ceremonies over the years that ultimately signaled a 'doomed' marriage. The photographers formed Reddit thread to explain how various simple moments at weddings ultimately spelled the start of a marriage breakdown.From smashing cake into one another's faces to fighting on the day of their nuptials, these were the tell-tale signs they could all agree on. Whether there was cake etiquette - Couple needs to be in sync. "Sometimes one of them (usually the groom) will force cake all over the other's face and embarrass and upset them. I've seen this happen a handful of times and all of those relationships that I have kept up with have ended in a divorce." Having a bad fight on the day - "If they are respectful toward one another (and toward me) during a day full of stress then I think that's a good indicator of being able to deal with other problems that may arise during a marriage," a woman said. When the couple are very quiet or won't talk - Just as overly loud and obnoxious couples can signal trouble, those that barely speak throughout the day are also a concern, so says their photographers. The omen of getting married outdoors - So other professionals chimed in to say they distrusted any sort of outside venue at all. Just try to be under some sort of cover. Whether it be rain or wind, you'll want some kind of protection from the elements - or it could lead to unnecessary fighting on the day,' another said. Our grand finale of the season will be on Sept. 18-20 in one of the most beautiful areas on the planet. Our headquarters will be in Fortuna, CA - an easy drive from the Eureka Airport only 25 minutes away. We're located on the Eel River, and situated perfectly to explore the Redwoods just south of us. This will be an excellent event to cool off, slow down, and get some great images. Plus, you'll be able to spend some quality time with your fellow virtual camera club members. We still have a couple openings on the reserve list. You can secure your seat by visiting TheNimblePhotographer.com, and place a fully refundable deposit for the event.